Take my CSS challenge quiz and see how you do. Open the quiz (opens in a new window). I realize if you don't know a lot about CSS right now, that list may not mean much to you. However, listing the Table of Contents is important because it shows how comprehensive CSS Made Easy really is. Webmasters who don't learn CSS will always be at a disadvantage to those who do. There are simply so many things you can do with CSS that are extremely difficult or impossible to do with HTML alone that those who can't implement CSS will always be doing things the hard way—and that means they'll be working less productively and with less flair. There's no comparison how much easier site updates are when you use CSS to set your styles. For example, suppose you want to change all your heading text from the color black to dark blue. Without CSS, you'll have to find every heading on every page of your site and make the change to each one. With CSS, you only have to change one word in one file and the heading color is changed automatically on every page! HTML is still an evolving language. HTML elements like <font>, <center>, and many others are already deprecated (the last step before becoming obsolete). HTML attributes like bgcolor, align, and many others are also deprecated. What will you do when these and other HTML elements and attributes become obsolete and are no longer supported by browsers? You'll have to learn CSS then, and have to remake all your pages, that's what you'll have to do. Either that or give up your web site. Unless . . .
...unless you start learning CSS now and start making your pages the right way. Then when those deprecated elements and attributes are obsolete, you can relax and let others sweat it out because your site is still standards compliant. You might even earn a second income just fixing other people's broken web sites, but you have to know how first. It comes down to this—do it right, starting now; or watch your web site fall apart when deprecated tags become obsolete. I have two great free gifts for you that are perfect complements to CSS Made Easy. The first is an ebook of CSS Reference Charts so you can quickly look up how to do what you want without hunting online for the code. This actually sells separately for $9 on this same site—but it's yours for free. The second gift is a Glossary of Internet Terms for Webmasters. You can learn more about each of these products in the right-hand column. Price Break! I've sold hundreds of copies of this product for $27, but order today and it's yours for just $17! Yes, this looks great! Finally an EASY way to learn CSS and I get the CSS Reference Charts and Webmaster's Glossary for FREE! 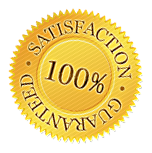 I understand I'll get immediate access to download the products and that I also get a 30-day money-back guarantee. Just $17.00! I recently saw a CSS reference book in the bookstore selling for nearly $45.00, and it was mostly like my reference charts only laid out differently (to make the book bigger, it seemed to me). It didn't have the easy-to-follow tutorials like CSS Made Easy does, and it wasn't spiced up with touches of humor either. When you consider that and the free gifts, it makes CSS Made Easy one sweet problem-solver! 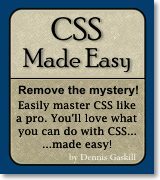 "CSS Made Easy is the best teaching text on the subject I've ever seen." For a limited time, when you buy CSS Made Easy you get two other excellent commercial products and another bonus product that complement it very nicely. Read about these free gifts below. A Glossary of Internet Terms for Webmasters is an 18-page PDF ebook that you'll no doubt find handy as a webmaster. This Glossary includes giveaway rights. You can include it as a bonus product with anything you sell, use it as an enticement to your visitors for subscribing to your newsletter, or simply give it away because you want to. If you looked at the sample chart you can see how comprehensive it is, and that's only one of 17 CSS Reference Charts. Each chart is colored in a similar style, but uses a different color scheme so you can find what you want at a glance when you get used to the colors of the charts you use the most. Print them out for easy reference or view them on your computer—either way it beats the heck out of hunting online every time you need to look up the proper code. Of course, you can buy CSS Master and the CSS Reference Charts separately if you want, but WOW, to get them free with CSS Made Easy is a superb value. That's why so many people buy product after product from BoogieJack.com . . . they know they always come out a winner! See why thousands of others have bought products from BoogieJack.com—get CSS Made Easy today and discover the higher quality you deserve! ...all for just $17.00. Order your special CSS bundle today before it's too late!